The Ring-Road Palace Wertheim (Palais Wertheim) presents itself as a new full service event location in the First District of Vienna. The Palace Wertheim was built in 1868 by Heinrich Ferstel for the tycoon Franz Ritter von Wertheim. On a total area of more than 1.000m² and 6 meters room height three impressive halls with different design variations are available. 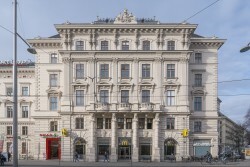 The palace became known primarily through the opening of the first and thus oldest McDonald’s branch in Vienna, which still exists at present.